Until now I have been taking it easy in the FiveFingers and not worrying too much about pace. I have probably been running easy 8s and 9s for pace. But last week I re-joined the work runners, and tackled intervals. I was initially planning to again take it easy, but got caught up in the fray and booked around a 6:40 on the way back from a “social” run. I was amazed that it felt fine, I was sure that I would have more aches and pains. Wednesday we did some moderate 7:00 miles, but then Thursday decided to hit it hard with three 1 mile intervals. My splits were 6:44, 6:41, and 6:45 – incredibly fast for me! I was totally amazed that I could run 3 miles that fast in them. I never really intended these to be speed footwear, really more of just an alternative to build leg strength. So I was pleasantly surprised to pull of some of my fastest running in them. They continue to amaze me. I also pulled off my first blister, and for the first time and wondering if maybe I went too big on them. I did 7 miles of single-track trail last weekend, and have a souveneir on my big toe. I think the sweating and extra foot movement on terrain caused a bit too much rubbing. But we’ll see – maybe these will callous up just fine. I also have some Injinjis to try out when the weather gets cool. This week is a rest week as I try to finally kick the piriformis problem that has hung around since my 22 mile training run before Twin Cities Marathon. Next week might be rest too. 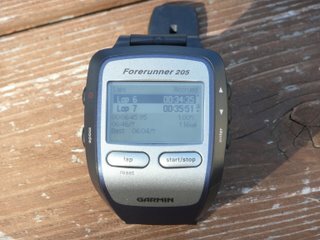 This entry was posted on November 5, 2008 at 6:44 am	and is filed under FiveFingers, Training. You can follow any responses to this entry through the RSS 2.0 feed. You can leave a response, or trackback from your own site.